Disclosure: My Baby’s Heartbeat provided the information and prize for this giveaway. I love seeing the gender reveals on social media! We adopted and were able to choose our daughter, but if we had a pregnancy I would have loved a gender reveal party. These parties are a fun part of the pregnancy process and an increasingly popular practice among expecting parents. If you’re looking for a creative new way to make your announcement, look no further than the new “gender reveal” kit from My Baby’s Heartbeat Bear. This unique kit consists of an adorable tan bear hidden inside a gender-neutral box and a 20-second red heart battery recorder that captures the sound of the baby’s heartbeat during your next ultrasound. Dress the bear in the included blue bow tie or pink tutu to make the big reveal in style. Created by a registered diagnostic medical sonographer and mom of twins, My Baby’s Heartbeat Bear makes a wonderful pregnancy keepsake beyond the big reveal, as well as a perfect gift for a big sister or brother. * Bears come in attractive gender-neutral packaging. No see-through windows or telltale colors! It’s easy to record your baby’s heartbeat! Take the recorder to your doctor’s appointment or local ultrasound studio and simply press to record 20 seconds of your baby’s heartbeat. And your ultrasound tech can dress the bear after your session. Then you can open the box and reveal baby’s gender in the comfort of your own home with family or friends! 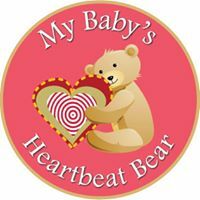 If you have someone in your family that can’t attend the party, a My Baby’s Heartbeat Bear makes a great gift. The bears are safe for ages three and up; as children grow, they too can enjoy the sound of their “baby” heartbeat. It comes with replaceable batteries; recording remains intact when batteries are changed. Available at many ultrasound studios across the U.S., to find one near you or purchase online visit www.mybabysheartbeatbear.com. A lucky KLY reader is going to win My Baby’s Heartbeat Bear Gender Reveal Kit! Enter in the rafflecopter form and good luck! I love the VINTAGE BUNNY one! So cute! This would be great for my sister! VINTAGE BUNNY would be my favorite but they are all cute! I love the teddy bear from My Baby’s Heartbeat Bear Gender Reveal Kit. If I won I would give it to my son, because he & his wife are expecting a baby. I like the Vintage Bunny. He’s so cute. This would be for my soon to be great nephew. It would be for my daughters to open with our next little one! I think they would love to be surprised and find out what the baby would be!! The Gender Reveal Bear the most, but the Vintage Bunny is so super cute!! My heartbeat animal will be for my nephew! The Vintage bear is so awesome. It is my favorite and also on my shopping list. This would be for my daughter. It would be a gift to keep forever. If I won I would give it to my granddaughter. She would love it. I think that the vintage fox is really cute. They are all so cute. My favorite one is the vintage bunny. This would be so nice for my newest coming grandchild.